I had a very productive weekend last weekend - I started prepping the projects for my June retreat, and my hands are still stained! But I also did some prep for today's blog hop as a guest of Hero Arts. This hop is for their Summer Catalog, which I got to see when I went to Boston for the Collins Show - but I couldn't show them to you so I've been squealing into a pillow until today. I had so much fun, and I couldn't wait to show these things to you - especially this first one. I laughed the whole time I was putting this together. Like everyone else my age, I was suitably traumatized by JAWS as a child. It, aside from The Wizard of Oz and 101 Dalmations, was one of those movies I remember experiencing sheer terror in. It might have been the first time I screamed uncontrollably in a theater (but not the last). I loved the movie, and its ensuing place in popular culture, especially the soundtrack, which is THE sound of fear and suspense. In more recent days, the popularity of Shark Week and the fun shark tracking you can follow for some named sharks in Florida is fun too - and I think society and shark research owe a lot to JAWS. To create the background, I just used Daniel Smith Watercolor into a wet wash with two colors to look like there's a light ray highlighting my murderous shark. The shark die is paper layering - it's hard to see here - but his pearly whites are poking out from the card in a delightfully macabre way. This die is perfect in every way! Then I cut the silhouettes with the same die set in black and added the hilarious sentiment from Killer Messages. I also watercolored the shark - leaving his eyes out until I was done, and then popping them back in. Now, I can show you a kinder, gentler, sea creature in case you're scared. 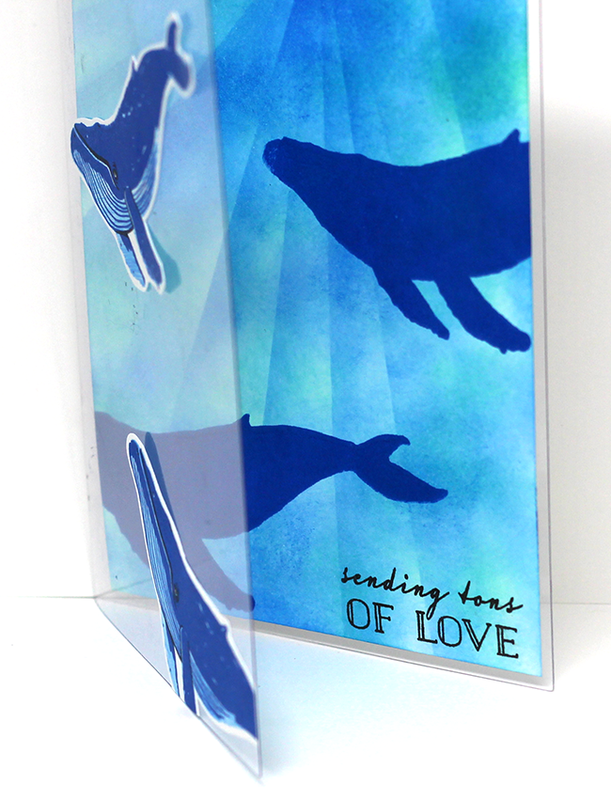 This beautiful color-layering whale card is what I made a while ago for the class at the show. I think that Indigo Ink is perfection for the blue whale. So the card is white cardstock, and on the front of it, I sponged Aegean ink all over the whole card front. Then, using a strip of cardstock, I sponged "rays" of Indigo ink to give the illusion of filtered light. Then I stamped the solid part of the whale image in indigo to make it look like whales that are far away. I stamped two more whales with all the layers and die cut them for the front. I also cut two more from Indigo cardstock to hide the adhesive on the back of the whales which are stuck on the front of the acetate card. The lower right whale on the acetate conceals the greeting from the same stamp set. The inks I used are Cornflower (from the bundle linked below), Indigo and black. I love all the blue and those sweet creatures. Now we can head back onto land, where we are safe! When I saw the Road Trip stamp set in the catalog, this card instantly popped into my head. I knew I wanted to layer different colors of watercolor for the mountains. To get this look, I stamped the full image on the bottom of the watercolor paper, and masked it with masking paper, stamping partial images to either side so that the pattern looked somewhat random as I moved up the card. Then I watercolored the mountains with my "desert" Daniel Smith palette of my own making, and then the sky. The sentiment is from Mermazing Messages. And finally - just to bring you all the way back from your fright at my shark - I have my favorite image from the whole catalog - this slinky, sassy, and charming little magical creature. SERIOUSLY - how cute is that?? She looks like she's about to tell you a secret. Or maybe stifling a giggle. Whatever she's doing, she's doing it with style, and I love her. Behind her is a fun new background stamp - Scribble - that almost looks like letters, but not quite. Maybe a fun new monster language is contained in there, and that's what she's keeping a secret! Anyway - I love it all. In a FB group I'm in, every now and then someone will ask the group "what's your favorite stamp?" My answer is always ALL OF THEM. The ones I own, the ones I don't own yet, and the ones that haven't been designed yet. I LOVE THEM ALL. If you want to see the amazing catalog, you can see it here. And you can get anything from the collection either from Hero Arts or Simon Says Stamp or Ellen Hutson now - all the products go live today. And as always, you can win some! Leave a comment at each blog on the hop for a chance to win one of THREE $25 shopping sprees from Hero. Be sure and leave your comment by Wednesday 5/24 at 11:59 PM Pacific to be eligible. 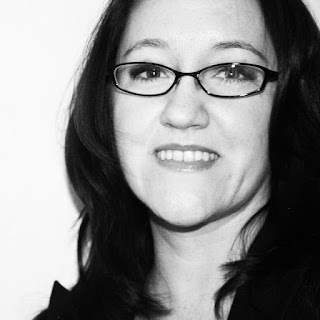 Next stop after my blog is the sweet & talented Jessica, and the full list is below. And if you're planning a trip to the ocean anytime soon... well, you know! MUAHAHAHAH. Oh I absolutely love your use of blue!!!!! What a fun collection of designs that showcase lots of the new stamps so perfectly. Such awesome projects! I love them all! An amazing set of four cards! The sky and mountain card is beautiful fine art! The shark bite is great humor and coloring. The acetate cover of the whale card is very clever and what a cute monster! Thanks for the inspiration. Ok - had to leave some love for JAWS - as the number one fan in the world!!! Your card is Jawsome - it should only be opened to the theme tune though, duh-duh!! I LOVE all of these, Lydia, but I absolutely, positively ADORE that Jaws card. So amazing! The follow your heart card is just amazing. I really love the shades of brown and blue you used. And, the magical creature really does look quite mischievous. The shark card cracks me up! I LOVE the sentiment! LOVE your shark card! My husband still stops every time he is channel hopping and Jaws is on. Just love these cards. And your background on the Follow Your Heart card is just stunning! Great cards! I especially love the shark card. What a unique stamp set. I'm looking forward to seeing what else is in store along the way. There's such great inspiration and as usual, Hero Arts is so creative! Love the shark card! Loved the movie too. Your watercolor is beautiful. I love the whale card it has so much depth and detail one of my favorites in this release. 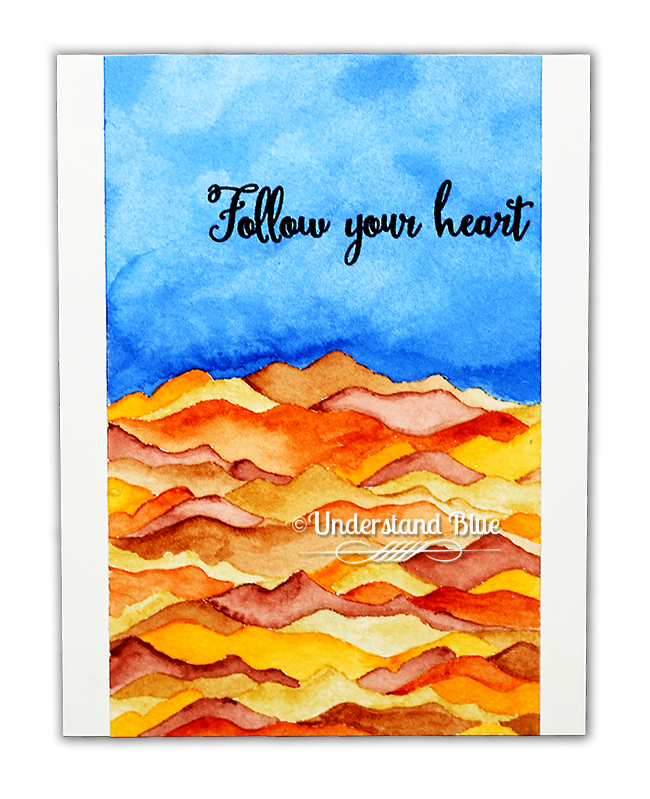 Your "Jaws" card is amazing - and so funny but your "follow your heart" card is downright gorgeous ! LOVE the colors you used ! I couldn't even begin to copy that - it is SO artistic ! Love them all - TFS ! Fun cards. Loved your shark attack card. I really love the follow your heart! It is so you! Thanks for sharing! I can hear the music when looking at your shark card! Well done. I love how the whale card turned out! Beautiful! Oh my goodness! You had me rolling! I clicked on the stamp set for your first card and decided the sentiment, "let's have a bite" is pretty hilarious too! Definitely going in my Faves of the weeks if you post it on SCS!!! Hilarious and pretty too!!! I am so glad to find out that I wasn't the only one terrified through Wizard of Oz! I had nightmares of flying monkeys for years! Hmmm.....You have me thinking on the camper set! I REALLY like those hills. If I changed the colors to blues my husband would be over the moon with a "smokey mountain" look card! Awesome cards! The whale card is fantastic! Love the sun rays shining down on that shark card!! Beautiful and creative! YIKES! Glad I'm not swimming in your sea...though it's beautiful. The sentiment made me giggle uncontrollably. This HA release is so full of fantastic images it's hard to choose. I know my wallet is groaning. Nice cards. I like the clear whale card. Very creative! I just love how you made the background for the whale card look just like the ocean when the sunlight shines through it. So pretty! This HAS to be the scariest Hero Arts set yet! Love your cards! The first one is so reminiscent of the Jaws movie. Now I want to rewatch it! And I agree with you about the adorable monster. She's soooo stink in' cute! Best card ever. Lol. So funny. Wonderful card. Love the swimmers! Cute cards. You are the woman with all the cool techniques! Wonderful whale card, Lidia. Thank you! Great products Hero Arts! All are great designs but I think my fave has to be the "sending tons of love" card. You colored the water in such a way that it really feels as if we are looking deep into the sea!!! Great job! That little critter at the end is my favorite. Love the whales but the shark card and sentiments are funny and super cute! All beautiful cards. Love the variety of ideas/inspirations. I love your final card!!! it is too adorable! All the cards are great! Your cards have a lot of feeling to them. Your work is amazing! Beautiful! Thanks so much for the inspiration! Adorable watercolor you did on you cards with so many ways ..Adorable cards and designs..Fun I see.. I just love the card with the whale, awesome made! The "Jaws" allusion card is magnificent! I haven't been so pleased by a card in a long time. I love the whales, too. Truly wonderful stuff. Ah..mazing, what you do with color and design is masterful; thanks for sharing! I love all your cards. My favorite is the whales, but then that little monster is just too cute. Thanks for doing all these cards. I love that watercolor! Great job on the cards! OmG! Your cards are so amazing!!! thank you so much for sharing your cards for inspiration! totally love all the colors you use and your card layouts!!! Nice cards. Thank you for sharing. Such great cards! I love the whale card, so detailed and beautiful! Thanks for sharing. Such beautiful cards!! I love the acetate card. So pretty. What a plethora of sheer joy in this post! Can't pick a favorite, but I'm still snickering over the JAWS card! You made my day! That shark! Love him (although likewise traumatized my the movie). Thanks for sharing your creativity. Your cards make me chuckle. You have a way with lightening up the mood and being fun. Plus your painting is beautiful!! I love the whale card! Beautiful colors. TFS! Ooooh, I love that scribble stamp now that I see it used. And paired with that cutie patootie, too; perfection! Love the "Jaws" reference as well. Fun cards! 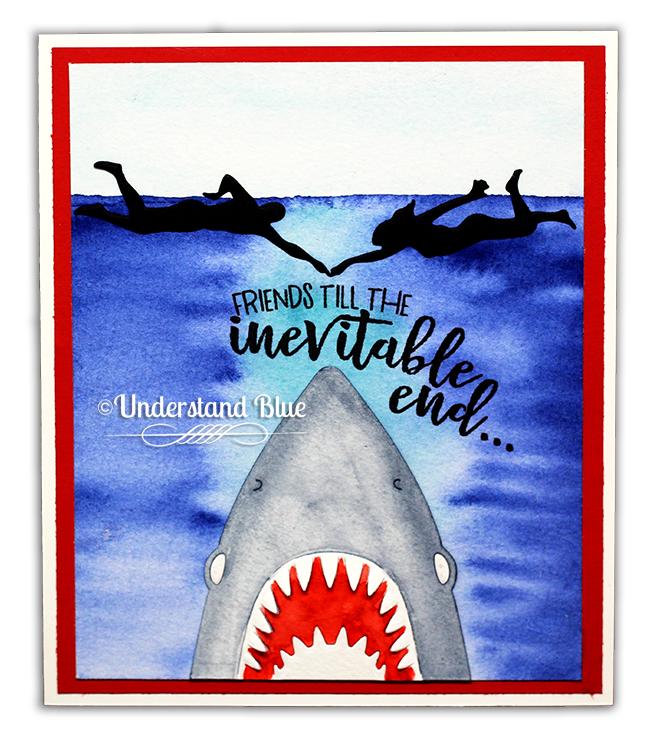 Jaws(just) too scary but love the whale(whole) blue card! The whale card is especially spectacular! Thanks for sharing! Your cards are beautiful. Love the blue whale card. Love all the cards, Lydia. So cool and "blue". LOVE, LOVE, LOVE that whale card! Great cards especially the shark one. Oh the first card is funny in a jaws -jaw,dropping way.. I love it. Your other cards are so creative. Great new release. I am really loving the shark set. I still remember the first time I ever saw Jaws at the Drive in movies with my mom and my uncle. Great cards, particularly like the whales, the colours used, great range of stamps. Amazing cards, love the red and green creature! The colors in these cards are amazing! This is a terrific batch of cards--love how many cute creations you've created! Favorite...hmmmm. Jaws. I can laugh about it now, but yes, suitably traumatized. It was a very long time before I'd go back into the ocean more than knee deep. Love the shark card! Love how you made the water look on your cards. Really love all of these cards. Thank you for sharing. Love all your cards. The shark card made me laugh out loud with the image and the sentiment. I adore the whale card. Waiting for that stamp set to arrive. You showcased a great release. Fantastic! That first card is hilarious and I just love the scenes you created in the second two! Cute and clever and created with great imagination. Go Lydia and Hero Arts! Lovely projects..very unique!Thank you for sharing! I will never forget seeing JAWS when I was ten. My room was next to our pool, so I heard the water filtering all night & I was positive the shark was going to kill me (how I thought it'd get to my pool, then in my room, well, only a 10 year old mind can work that out). Love your colors, but that shark card is my fav! I still don't go in the ocean,lol, but your shark cracked me up!! I adore the acetate whale card, maybe a video or description on how you attached it to the card, I would like to try it. I love the whale card, thanks for some awesome cards. Wow, you were in the 'zone' when you created these cards! Over the top! Love the shark one for obvious humor value, the whales are tremendous and love, love your mountains! Great post! Love your bright coloring! Your cards are fun. Thanks for sharing! Yes, it is a bit sick and twisted, but kind of funny, too. Enjoyed all the other examples. Your shark card is so clever and unique. Thanks for bringing a laugh to my day by sharing your creations. I just love the scenes you created for your cards! The colors are fabulous! I love the variety in this release! Thank you for the inspiration! The colors on these cards are beautiful. The shark card is hilarious! Amazing coloring on all your cards, but I'm in love with the blue background on the whale card and your design! Fun cards - they should get some smiles! All your cards are fabulous. But the shark really made me giggle. Duh-nuh, duh-nuh. 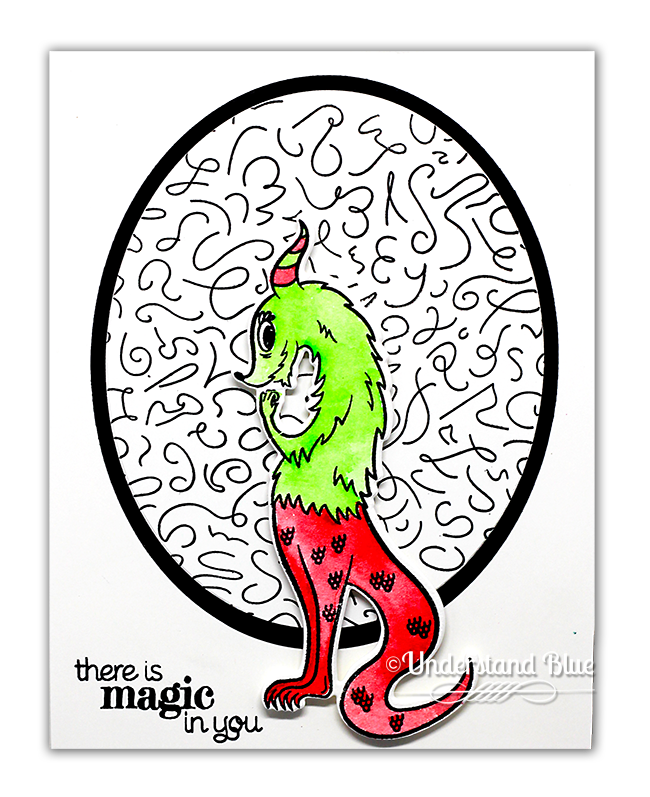 Awesome cards with fabulous coloring! The shark is a favorite! What fun cards! I love the water scenes - funny and gorgeous. The last one reminds me of Dr. Seuss. Your c ads are so clever! Sharks rule and I love your card! What a wonderful collection of cards! But that shark stamp really reminds me of Jaws....the poor swimmers above! These are all so incredible! I just love each and every one of them...especially the first one! Gotta love JAWS!! Love your take on this release. Great cards. Love the shark card. I saw JAWS before a snorkeling trip to Florida. Oh my !! These colors !!! Fabulous cards using the new release images. many ways to use him. Love the little magical creature. .....pink like that tint in the water...........we could so be friends. Your blog is a hoot to read. Love the shark card, but I am also in love with that magical creature. She looks a bit mischievous. Your sense of humor cracks me up and I have now subscribed to your blog, not only for the ideas, but for the laughs! I freakin' flipped for all of your cards! Lydia you have out done yourself, all of these projects are awesome and your watercoloring is going gang busters! Thanks so much for sharing your talent with little ole me! bwahahaha....I LOVED horror movies when I was kid and loved Jaws. Friday night, with my BFF, alone, lights off, horror movie and popcorn on. I know I am crazy and twisted! I really like your backgrounds. What a great idea! Your cards are awesome. I like the whale one. Thanks for the bits of background info...I always enjoy reading your posts. Wow, you have some amazing creation here! Coming from Australia, I'm loving the shark themed sets. Thanks for the inspiration. Great cards, the Jaws reference is definately shivery! Cards are great...liked the use of acetate! Great cards...i adore the first one. So creative and funny! Wonderful cards! Love the whales on the acetate and the rays of light. The scribble background stamp is one of my favorites! The wheels are gorgeous. I can't wait to try using them! The acetate card is so creative and the desert is just awesome watercolor! But that last creature reminds me so much of Dr. Seuss that I want green eggs and ham! I had the same thought when I saw the Jaws set. Love the ocean and all the sets related to it in this release. Your cards are beautiful. Fabulous cards! Love the whale card! WOW!!! Such Amazing Cards! I love your depth with the sponging. The JAWS card has to be my favorite. Hero Arts is such and innovative and influential company! WOW!!! Those blues are intense,I love the whale card!!! Lydia, these are amazing..the first Jaws card had us laughing out loud..I am sitting here at Starbucks hopping through the blog...then the next card is so adorable...wow..the rays look like they are streaming through the ocean. Love them! I love how rich and vibrant your acetate whale card is absolutely beautiful! Not sure if my comment was sent as I got a weird message so I'll try again. If it was sent I'm sorry for the repeat. All your cards are amazing but I especially love the shark and the whale cards!! The water backgrounds of both of them are beautifully done. 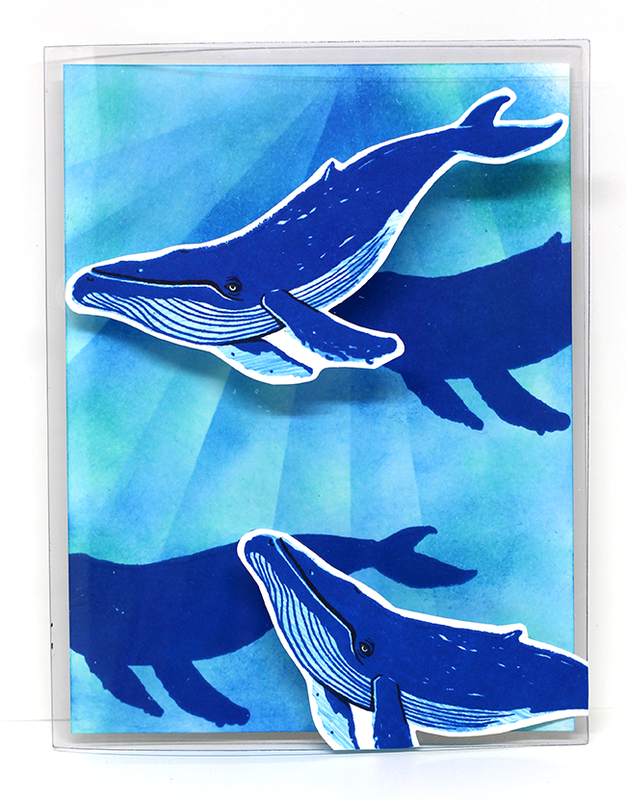 The acetate layer on the whale card is an awesome idea and so creative. I love it!! Beautiful cards, love all the blues. Love the clear card, so pretty! I always love your cards and this one is no exception! Definitely I love the shark!All your cards are awesome. I love what you did with the whale card. All of your cards are so beautiful! You have a great sense of humor! That first card IS kind of scary! The second one is so creative with the whale stamped on the acetate hiding the sentiment! The water with the light filtering in is wonderful! Great card! "Follow your heart" is quite lovely!and the whale card is breathtaking! The monsters are so dang adorable! They remind me of Cat in the Hat characters! Your Jaws card makes me think that you really want to be a faster swimmer than your friend! LOL TFS! Your whale card is just stunning!! The background and the technique are just amazing!! Awesome cards!! I too was traumatized by Jaws as a child. My sister thought it would be hilarious to have me watch it the night before I left for the beach with a friend. I wouldn't get any where near the water until 2 days before we left. LoL!! So your card really cracked me up.Thank you so much for sharing!! Thanks for giving us so many cards to show off the new HA release. The whale one is my favorite. Wonderful cards. The whale is definitely my favorite! 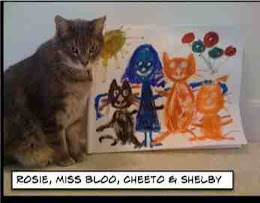 Your watercolor painting is fantastic! Your whale card is very cleaver. Beautiful cards, thank you for sharing with us! Oh dear, such a freaky card that shark one. But the sentiment fits so perfectly. Love your work. Totally awesome projects here, Lydia! Super fun cards and release! Your whale card is just stunning! And I love all the different ways you used the stamps - from scary to quirky to classic! Thanks so much for sharing! Love your cards. The whale on the acetate is fantastic! AWESOME cards, I especially love your Road Trip card! Great release! Winner of OCC Sparkle and Shine! Eastern Beauty Online Class & Sparkly Giveaway! But Wait - THERE'S MER!